Last Saturday we drove out to Boyne City to visit a lavender farm that I had recently learned about. While sitting at a traffic light I was admiring the visitors center. It has a real up north feel and the garden area out front is fabulous. We visited a gift shop that had the cutest flower garden sandwiched in a courtyard that's between the two sides of their store. I've seen those shovels for sale at different stores. They're have laser cut designs in them. Love that clay flower pot arrangement so cute! This lavender farms uses no pesticides, herbicides or fertilizers. They sell edible lavender and soaps. They had a little fairy garden and I got a kick out of seeing this cottage (which is by the same company that made mine). Of course the roof on theirs is lavender! I did a post on my other blog you can see "here" about our visit. On Sunday we were hit with a freaky storm. I stood inside the house watching it wreak havoc on the back yard so I used my cell phone to take a little video which I've posted at the bottom. My hydrangea took a bad beating. We had a lot of hail and frankly I'm surprised that we didn't have more damage. No biggie but the old fairy garden got a bit ruffled up too..
My poor ferns are trashed. These next photos are images that local people shared on one of our news sites. 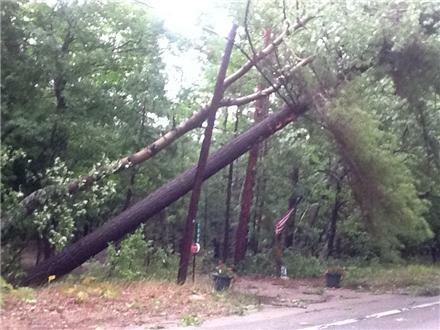 These are real pictures of this storm that swept through the area. This one was taken overlooking Lake Michigan. These are call shelf cloud formations which brought in straight line winds that were between 70 to 100 mph. Trees were knocked down everywhere. I understand that where it's green is indicative of hail..which we got plenty of. Some had hail the size of plum and made huge dents in their cars and broke windows. This one looks surreal. It was taken at quite a distance away but captured how the storm looked as a whole. It was massive and pretty close to a tornado. We experienced about 70 mph winds at our house but about 30 miles north of us got it a lot worse. 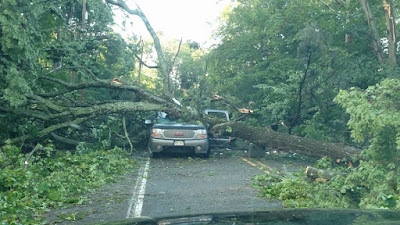 This is one road is in the very picturesque little town of Glen Arbor located near the Sleeping Bear Dunes National Park that got it the worst. The massive amount of trees literally closed off all the roads to get in or out of town. A man and his son barely escaped this near death experience. Trees were blown right over landing on electric lines and power was lost to thousands. Our power went on and off so Dan went down and shut the whole house breaker off to the house to be safe. Fortunately afterwards we had power and were grateful for that. I took an armload of metal stakes and lifted the hydrangea branches up the best I could. A few are broken but considering the lashing it took I'm pleased it's not worse. My Endless Summer hydrangeas have holes and torn spots in the leaves from the hail we got. It could have been a lot worse but I sure don't want to know that that would be like! I used my cell phone to take a video but it doesn't show the true gravity of what took place in our area. I thought I was recording for about 2 minutes when I realized I hadn't actually started recording so this is my 2nd attempt but most of the heavy duty stuff had backed off. Anyway…. What a difference a day makes! Liz, God was good to you. There was some damage, but all is well. You are a lovely lady w/ incite & style. That looked like a hell of a storm. Whew, that was some storm! 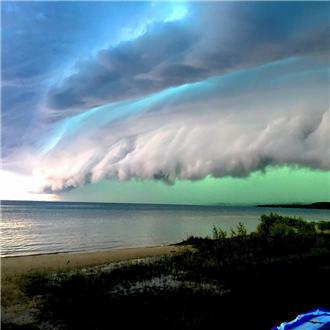 The pictures are amazing - never seen anything like those cloud formations. And it was nice to finally put a voice to your picture in watching your video despite the circumstances. Glad everyone was safe! Mother Nature is showing signs of having too many meltdowns lately! Wow, that was quite the downpour, with hail and thunder. Pleased to know you were not affected by the fallen trees. Can you save the hydrangeas ? One never underestimates the power of a storm until they have experienced first hand the damage. I will n e v e r forget how solemn "Mr. Ed" was when he returned home from Greensburg, Kansas. Working for Kansas Department of Transportation, he was a "First Responder". He told me, "There are n o words to describe the destruction." So~o~o grateful that you and Dan are alright. What a mess! I feel for your ferns and flowers. Mother nature sometimes doesn't play nice. After all your hard work. A good thunderstorm is kind of cool, but not the damage it creates. Late Summer but still in bloom!